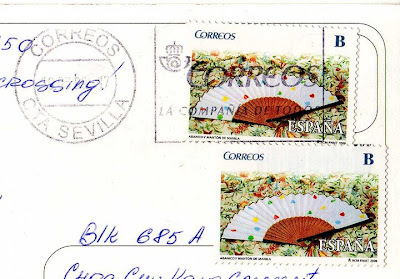 eD@HoMe: Lovely postcards from Brunei, Netherlands & Spain! Lovely postcards from Brunei, Netherlands & Spain! Good day! Here’s another 3 awesome postcards from my recent acquisition. 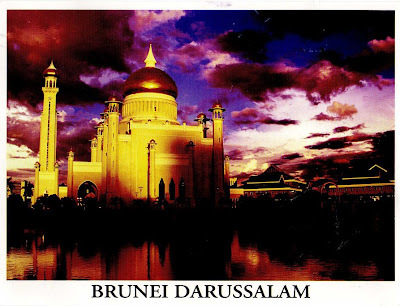 Many thanks to Angelina for sending this gorgeous postcard from Brunei. It is my first postcard from this lovely country! Named after the 28th Sultan of Brunei and designed by an Italian architect, Sultan Omar Ali Saifuddin Mosque was built in 1958 in the capital city of Bandar Seri Begawan. The golden-domed structure, the tallest building in the city, has Italian marble floors and walls. It is classified as one of the most spectacular mosques in the Asia Pacific and a major tourist attraction. Sultan Omar Ali Saifuddin Mosque is considered amongst the people of Brunei as the country’s major landmark. 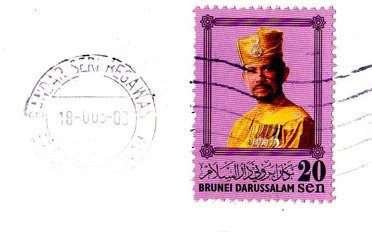 The stamp used on this lovely postcard is part of the portrait of Sultan Hassanal Bolkiah definitive Series, issued in 2006. 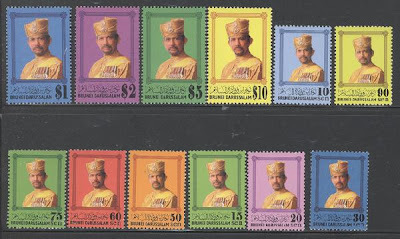 Sultan Hassanal Bolkiah is the current Sultan of Brunei. He is also the country's Prime Minister, and is the acting head of Brunei's Defense and Finance Departments. Because of Brunei's oil-wealth, Bolkiah possesses vast personal wealth and is known for living lavishly. In the 1980s and 1990s, he was the world's richest man with a net wealth estimated at $38 billion according to Forbes. Next, we have this lovely postcard sent by Detje from the Netherlands. Thank you very much! Friesland or Fryslân is a province in the north of the Netherlands consisting of islands and peninsulas interconnected by the dams and bridges. Translated into English, it literally means sea land because that’s basically what it is. Tourism is an important economic activity for Fryslân. Its sunny beaches make it a popular holiday destination in the summer. In some areas, the population can be two to four times higher during high summer season. 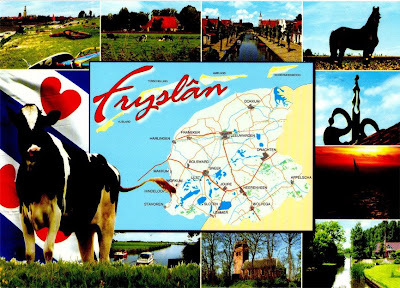 Fryslân is also famous for its black and white Friesian cattle and black Friesian horse (shown on this postcard). The stamp on this card belongs to a set of 2 priority stamps issued in 2009. 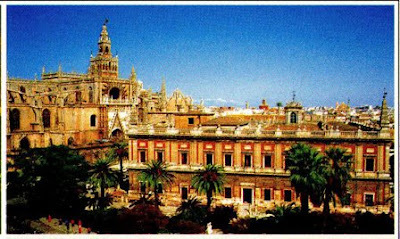 Great thanks to Vicky from Sevilla for presenting my first postcard from beautiful Spain! 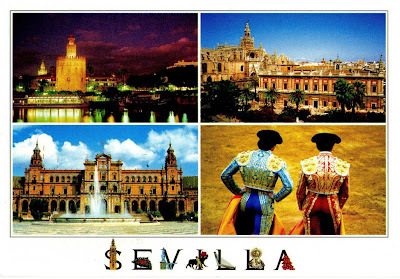 Seville is Spain's 4th largest city with a population of some 710,000. There is nowhere else in Spain that complies so closely with the foreigner's perception of stereotypical Spain as Seville. 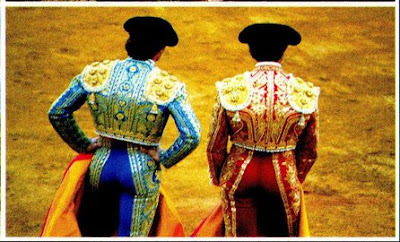 For it is here that flamenco, bullfighting and fiesta are a way of life. Never more so than during the Feria de Abril (2 weeks after Easter Sunday) when everyone seems to hit the streets for a week long party. 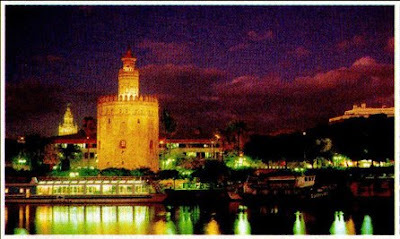 The Torre del Oro (Spanish for "Gold Tower") is a dodecagonal military watchtower built during the Almohad dynasty in order to control access to Seville via the Guadalquivir river. The Cathedral is claimed by some to be the largest Gothic cathedral and the fourth largest Christian church in the world. Construction of the cathedral began in 1402 and continued into the 16th century. 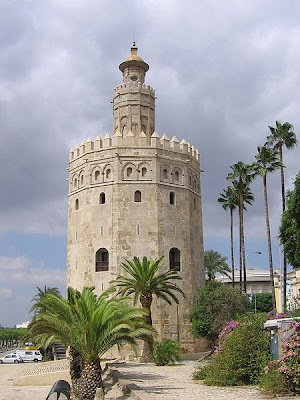 There are steps from inside the Cathedral to the top of the 90m high Giralda which is the minaret of the former Mosque. 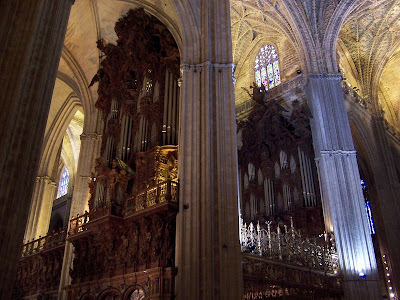 The interior, with the longest nave in Spain, is lavishly decorated, with a large quantity of gold evident. In the main body of the cathedral only the great boxlike structure of the choir stands out, filling the central portion of the nave. It is also dominated by a vast Gothic retablo of carved scenes from the life of Christ. The altarpiece was the lifetime work of a single craftsman, Pierre Dancart. 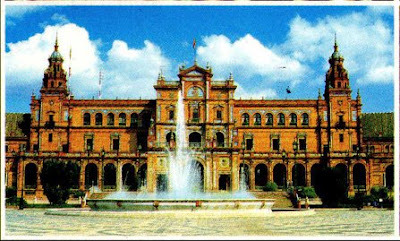 The Plaza de España is one of Seville’s most easily recognised buildings and the epitome of the Moorish Revival in Spanish architecture. The Plaza is a huge half-circle with buildings continually running around the edge accessible over the moat by numerous beautiful bridges. In the centre is a large fountain. 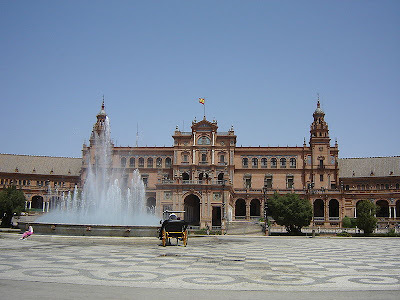 Today the plaza mainly consists of Government buildings. Spanish-style bullfighting is called a corrida de toros (literally a "running of bulls"), or fiesta brava. In traditional corrida, three toreros, also called matadores or, in French, toréadors, each fight two out of a total of six fighting bulls, each of which is at least four years old and weighs up to about 600 kg (with a minimum weight limit of 460 kg for the bullrings of the first degree). Bullfighting season in Spain runs from March to October. 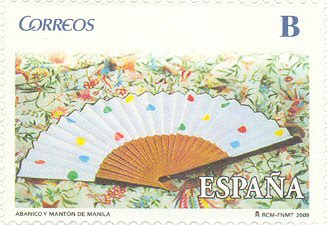 The stamp on this card belongs to the ‘Fan and Mantón of Manila’ series, issued in 2009. It is a single issue.